FeastHome – Ever considered pimping up your kitchen? If you have, do you know the effect a pimped-up kitchen would have on your home? Pimping your kitchen is no doubt a great way of not only enhancing the kitchen’s looks but also improving the overall beauty of your home. Pimping involves adopting creative ideas and using decorative accessories to change the image of the kitchen. Pimping your kitchen is not a difficult task and most of the ideas can be created and formulated at home thus ensuring you spend a little amount of money to enjoy amazing results. No matter the size of your kitchen or its layout, you will certainly find great pimping ideas which guarantee results. However, make sure that you adopt a systematic approach which will ensure you avoid putting excess details which will interfere with the intended outcome. 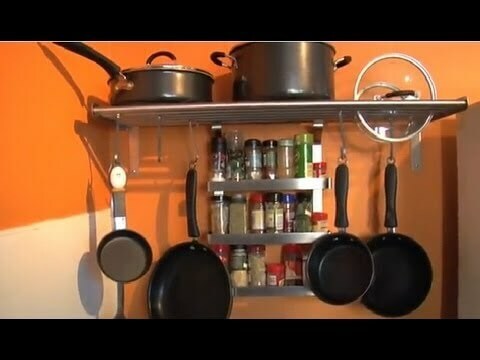 Below is a detailed list of ways through which you can pimp your kitchen. Space is an important factor for any kitchen as it facilitates efficiency in the kitchen. There is need to constantly create more space in your kitchen as your kitchenware needs grow. The surest way to create space in your kitchen is by changing the way you arrange items in your kitchen. In addition, introducing shelves and in-built racks will help in creation of important space. To create space, ensure that you use containers to store most food items. Containers will enable you to store food items in one place thus you save space and easy retrieval of the items. More to that, ensure that you arrange the containers in an orderly manner that will ensure saving of space. You may also opt to add more shelves in the kitchen to create more room for storage. Space provides an opportunity for proper kitchen organization which is the first step towards owning a great pimped up kitchen. Introducing an artistic aspect in your kitchen ensures that you attain a unique image with your kitchen. Kitchen artwork consists of wall paintings, table mats, rugs and wallpapers. Kitchen artwork comes in different sizes, colours and creations. Therefore, ensure you figure out the type of image you want to achieve with your kitchen. This will guide you through the process of finding the ideal piece of artwork that will suit your kitchen needs. More to that, you can create your kitchen artwork at home which allows you to incorporate personalized details that cannot be matched elsewhere. Other forms of art that can enhance the image of your kitchen include: exotic kitchen plants which are artistic in nature, painted storage containers which not only create space but also act as a decorative accessory when properly arranged. A pimping exercise cannot end without a complete colour change or colour improvement. Pimping your kitchen entails giving the room a complete transformation. For that reason, it is important that you weigh your options wisely to ensure that you settle for colours that will have a positive effect on your kitchen. 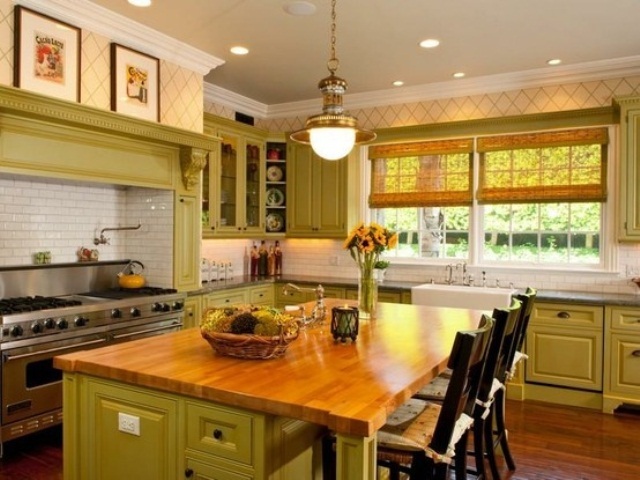 To find the best colour for your kitchen, ensure that you apply bright colours. More to that, you may also consider using a variety of colours that will help you create an appealing colour combination. When choosing your kitchen colours, make sure you look for quality colours that will provide a long-lasting effect on your kitchen. To achieve the best results with your colour choices, consider acquiring a great light system which will be supplement the bright colours. The effect of quality light on a great colour combination will positively impact the mood in the kitchen thus you will find yourself spending more time in this important room. Trendy kitchen appliances and well-designed furniture are another great way of giving your kitchen a complete makeover. Modern kitchen appliances play a crucial role in improving the experience you enjoy in the kitchen and at the same time adding beauty. These appliances are available in various designs and shapes which means they will have a noticeable effect on your kitchen’s outlook. On the other hand, furniture with great designs will boost the image of the kitchen. When purchasing kitchen furniture make sure you only settle for something that adopts the colour scheme you are looking for. On the other hand, you can choose to acquire plain furniture and apply the colour of choice. This will see to it that the colours on the wall synchronise with those on the furniture and appliances to provide a stunning effect on the kitchen outlook. 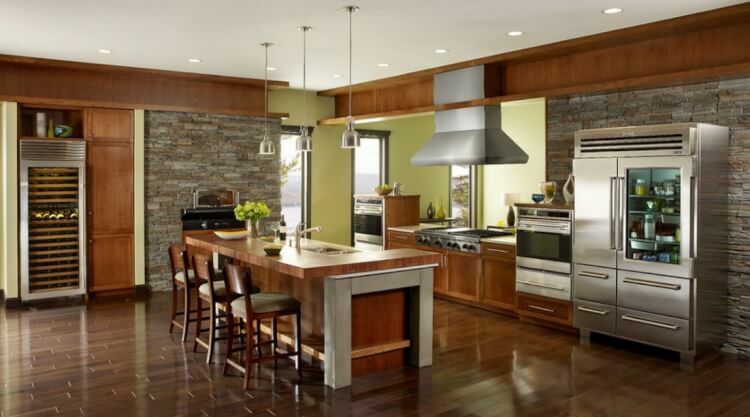 Pimping your kitchen will certainly change various aspects in your home apart from the beauty. Additionally, great pimping results can be achieved in any kitchen and at very reasonable rates. To achieve the best results, creativity will come in handy to ensure you adopt unique ideas that will see you conduct a fulfilling mission. In a nutshell, if you are worried about the state of your kitchen and do not know what to do to improve the situation, be sure to consider pimping the kitchen using the provided ideas. You can rest assured that the results you will get will leave you eagerly waiting for the next pimping exercise.